It is shown that dark matter and dark energy correspond to the rest of parallel universes of the invisible Multiverse, except for ours. Presumably, our Multiverse has a structure of at least partially closed screw ring, which includes 20-24 universes. Six of these universes are adjacent to our universe. Such structure of the Multiverse vaguely resembles the structure of the DNA molecule. • dark energy - for other more remote universes, which, consequently, are shielded from us. Invisibility of the Multiverse and all universes (except for our universe) is mainly conditioned by the fact that these universes are outside of the horizon of events with relation to each other, as they (same as, for example, tachyons) comply with the imaginary numbers in accordance with the corrected relativistic formulas of the special theory of relativity (STR). Therefore, so-called tachyon universes and tachyon antiuniverses are adjacent to our universe (provisionally called tardyon universe) and followed by tardyon antiuniverses and the rest of the universes. Their annihilation is prevented by the indicated alternation of universes and antiuniverses, both tardyon and tachyon. In this case, all universes are inertial reference systems, and hence, they are similar to each other for their inhabitants in accordance with the first postulate of STR. Possible structure of such Multiverse is shown in the presented figure. 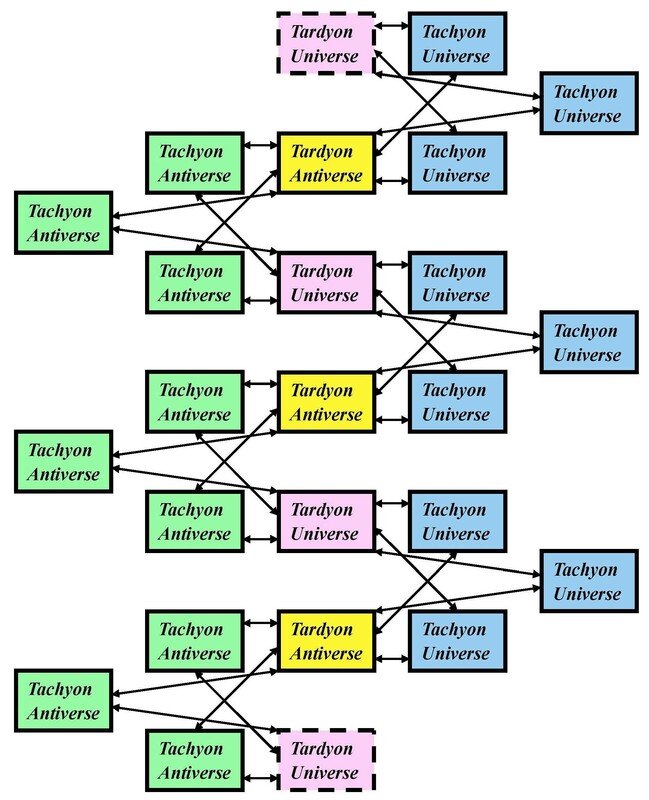 Tardyon universe, being a conditional beginning and a conditional end in the ring structure, is marked with a dotted outline on this figure. This structure of the Multiverse was proposed by Dr. Alexander A. Antonov, who received his PhD at the Saint-Petersburg State University of Aerospace Instrumentation in Russia. It is based on the principle of physical reality of the imaginary numbers that was proven by Dr. Antonov and which refutes the assertion of non-exceedance of the speed of light in the current version of the STR. Physical reality of imaginary numbers was proven by experiment in a study of oscillatory processes in linear electric circuits. Description of these experiments is given in many publications. Therefore, they can be repeated and verified at any radio and electronic laboratory. Consequently, in contrast to the failed physical experiments MINOS at the American Tevatron collider and OPERA at the European Large Hadron Collider that were performed substantially with the same purpose, namely to prove physical reality of the imaginary numbers, results of these experiments were quite reliable. Fig. 1. Possible structure of the invisible Multiverse. Moreover, universes included into the hidden Multiverse are parallel universes, i.e. despite their immensity, they do not intersect. Due to operation of unknown to us mechanism of automatic adjustment of their mutual spatial position, these parallel universes slightly move with relation to each other, sometimes touch each other in some places, and even slightly penetrate into each other. Then, certain transition zones or portals (which have nothing to do with so-called 'wormholes' in the current version of the theory of relativity) appear in these places. It becomes possible for elementary particles and human inhabitants with their transport vehicles (except for planets and larger objects, disappearance of which at our universe would be noticed by astronomers) to transit through these portals, which are shown in figure with bilateral arrows, during the time of their existence without the need to overcome light speed barrier. Such portals in the world (same, as in the rest of the universe) are numerous. It is probable that the transition through such portals to adjacent parallel universes (if transition is allowed by its inhabitants) is relatively safe (same, as, for instance, household current is safe if no one touches it), as according to the law of communicating vessels, parameters of the environment in pre-portal and behind-portal areas should be almost identical. Otherwise (if, for instance, at least one Earth portal is opened in the open space) our planet would be left without its atmosphere and hydrosphere. What, possibly, may have once happened on Mars. Since the astrophysical contents of the different parallel universes is, obviously, different, then, by moving through the mazes of portals from one universe to another, space travelers could significantly reduce the extent and duration of their travels, for example, to a very distant star systems in our universe. Moreover, since according to the corrected relativistic formulas of the STR, time in different universes can flow in different directions, travels not only in space but in time become actually possible. In this case, development of resources at adjacent universes (one might recollect the discovery of America) can significantly accelerate the development of human civilization. Finally, human civilization can escape through such portals in the event of a global threat to its existence.